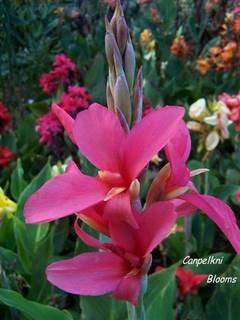 I’m thrilled growing cannas as they flower for eight to nine months of the year in my climate. These tropical plants add some structure to my garden with great foliage colors and also have a great tolerance in the dry times. Classic cannas are at home in cottage gardens themes and dry gardens, even though they are fairly dry tolerant the aquatic cannas are suitable for backyard ponds either planted around the edge of a pond or submerged. There are many positions for these exotic plants, when Planting Cannas remember they are sun and heat loving plants, they can be grown in hot tropical climates and cool n temperate areas as well. Cannas grown in snow laden areas will have to be lifted out of the ground before the winter snow arrives and replanted the following season once the winter snow has passed. Cannas in Winter visit here to learn about how frost and winter affects cannas. Big clumps of cannas are tough water wise plants, but its wise with single small sized divisions to be careful when watering cannas not to overwater any small plants or they may rot. Rhizome Propogation and how much growing cannas can increase. Cannas like to be in a sunny position, although its not essential If your neighbor’s have prying eyes, then plant some tall growing canna plants along your fence line's for privacy, you can also use them to provide shade and protection for more tender perennials plants. Cannas love a sunny position the more sun the better. Cannas need sun learn why a sunny posistion is essential. By mass planting cannas you will get a full show of flowers and foliage which will make key areas look more exotic and tropical. Cannas are great for planting alongside swimming pools, I’ve seen some beautiful varieties grown in this position and the odd splash of chlorine water doesn’t seem to harm them. On a recent holiday along the coast of the Great Ocean Road I was pleasently surprised to see many home gardens with cannas in their planting schemes.